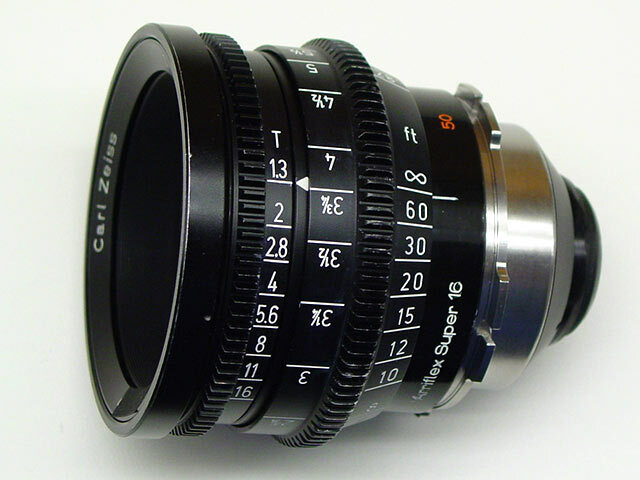 The Carl Zeiss Standard Primes are 35mm format f2.0 lenses developed by Carl Zeiss for ARRI (then Arriflex), and predate the original Zeiss f1.2 High Speed series (Super Speed in the U.S.). Information on when the original set was introduced is hard to come by. A safe guess is after 1964 and before 1975. It is likely that this set was just called something like the “Zeiss Primes for Arriflex”, and once the High Speed lenses were introduced in 1975, they became the “Standard Primes”. These lenses are comparable in size to the Cooke Speed Panchro but are a more modern design and significantly exceed the optical performance (on the technical merits) of the older Speed Panchros. Focal lengths in the original series are Distagon 16, 24 and Planar 32, 50 and 85mm. An 8mm focal length for 16mm format was also available. The small size of the lens barrels allowed three of them to be mounted simultaneously on the 3-lens turret of the ARRI 35IIB/C cameras. They also fit inside the prime lens blimp of the Arriflex 35BL I/II. When introduced, the Zeiss Standard Primes had the original Zeiss single layer anti reflective coating and were marked as T2.2 except for the 16mm which was a T2.4. In the early 1980’s an updated version of the Standard Primes Mk. I was made with the T* multcoating (same as on the Super Speed lenses), and these lenses are marked at T2.1, except for the 16mm marked T2.2. In the mid 1980’s Zeiss introduced a “Mk. II” version of these lenses with larger housings that included integrated focus gears and accepted ARRI Bayonet or PL mounts. The optics in these Mk. 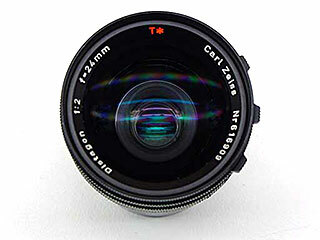 II T2.1 lenses are exactly the same as the optics in the smaller barrel version, only the mechanics differ. The Mk.II series eventually had more focal lengths of new design added: 20, 28, 40, 100 and 135mm all T2.1. In the industry, these lenses were commonly referred to as the Zeiss T2.1 primes. Note: The Planar 2/135mm is listed in a 1978 ARRI brochure as being part of the “Super High Speed” series, but in a 1983 brochure it is listed as part of the Standard Prime series. There is no right answer to this and the 100 and 135mm Standard Primes are frequently used together with the T1.3 High Speed primes (longest focal length 85mm). There is no problem cutting between them other than the limitation on maximum aperture. Design Focal Length f# T# Format Coverage Distagon T* 10mm 2.0 2.2 Super 35mm Distagon T* 14mm 1.8 2.0 Super 35mm Distagon T* 20mm 2.0 2.1 Super 35mm Distagon T* 28mm 2.0 2.1 Super 35mm Planar T* 40mm 2.0 2.1 Super 35mm Planar T* 100 mm 2.0 2.1 S35mm, APS-H, partial FF35 Planar T* 135mm 2.0 2.1 S35mm, APS-H, partial FF35 Sonnar T* 180mm 2.8 3.0 S35mm, APS-H, partial FF35 Tele-Apotessar T* 300mm 2.8 3.0 Full Frame 35mm (FF35 24 x 36) Side view, Planar 32mm T2.2 Standard Prime Mark I with focus “ears” NOTE: There is a 12mm T2.1 lens that was an ARRI product and is not part of the Standard Primes series. It was constructed by using a Distagon 16mm T2.1 with a permanently attatched aspherical front element (aspheron) and carried ARRI branding. Optex also produced a 10.5mm T2.1 lens using the same method. Note: The optics of the Mark I and Mark II Standard Primes with T* multicoating are identical. I have tested Mark I and Mark II lenses against each other on a Zeiss MTF Tester and the results were identical. The following comments will apply to all Standard Primes T* regardless of the mechanical housing. The optical design of these lenses is considered classic. Wide open, contrast is lower than what a modern prime lens (S4, Ultra Prime) can deliver. There is a “spacing” between the 10, 20 and 40 lp/mm MTF curves that is characteristic of a vintage lens. This means that progressively finer details get rendered with less contrast. This is true of all lenses, but the effect is more pronounced with older optical designs. This type of detail response is considered pleasing by many, especially when these lenses are used in conjunction with a high resolution digital cinema camera. Comparing the Distagon T* 2/16 to the Cooke Speed Panchro 2/18 wide open there is a similar spread between the 10, 20 and 40 lp/mm MTF curves, but the Distagon’s overall contrast is higher 87% vs 75% at 10 lp/mm on-axis. At the f-stop for peak on-axis MTF @40c, (f 5.6 for the Distagon and 3.7 for the Speed Panchro), the difference is more pronounced. The Distagons’ overall contrast is significantly higher and the 10/20/40 lp/mm curves are much more symmetrical and have a smoother transition from center to edge. Peak sharpness for the Distagon occurs at image height I’=4, whereas for the Speed Panchro it occurs at I’=12. All Zeiss Standard Prime lenses (both the older and newer designs) exhibit some positive focus shift when stopping down. This is indicative of a “relaxed” correction of spherical aberration, especially on the older designs, which is associated with pleasing bokeh. For this reason it is recommended to stop down to the aperture you are going to shoot at and then adjust the focus for best results. All lenses in the set exhibit positive field curvature, except for the Distagon 2/28 (which is widely considered the best of the Standard Primes for optical performance). These lenses use the Zeiss Planar symmetrical design. The Planars are knows for high sharpness, high contrast, very good flatness of field (focus does not fall off in the corners) and very pleasing bokeh due to the simple symmetrical lens design. The 85, 100 and 135mm Standard Primes are superb close-up/portrait lens. As a general rule, T* coated Standard Primes can be intercut with modern cine lenses, with a good match in perceived image sharpness, as long as the ST’s are stopped down to T4. Many cinematographers feel the bokeh of the Zeiss Standard Primes is more pleasing than that of the Zeiss High Speed primes. Parts availablity: Spare parts for the Mark II Standard Primes were discontinued in early 2011. Although mechanical parts for the Mark I Standard Primes had been discontinued long before that, the lens elements were still available since they were the same ones used on the Mark II version. This is less of a disadvantage now since spare parts for the Zeiss High Speed (T1.3) lenses have been discontinued since March 2015. The mechanical housings of the Standard Primes Mark II are slightly less durable than the High Speed (Super Speed) Mark II because the Standard Prime housings use smaller diameter helical focus threads. The main disadvantage of the small barrel Mark I Standard Primes is that the focus scale is very small and was designed to work with the index mark on the ARRI Standard/Bayonet lens mount. When fitted with focus gears and PL adapters, the focus scale is practically impossible to see on an unmodified lens. Since there is a large span of time between the design of the original Standard Primes set and the focal lengths that were introduced later, the set is not well matched for sharpness or color rendition. This is one reason why there were superseded by the Ultra Primes series. Front view of the original Mk. I T1.4 Super Speed prime lenses for Super 35mm cinematography. The differences in maximum aperture can be easily seen here. 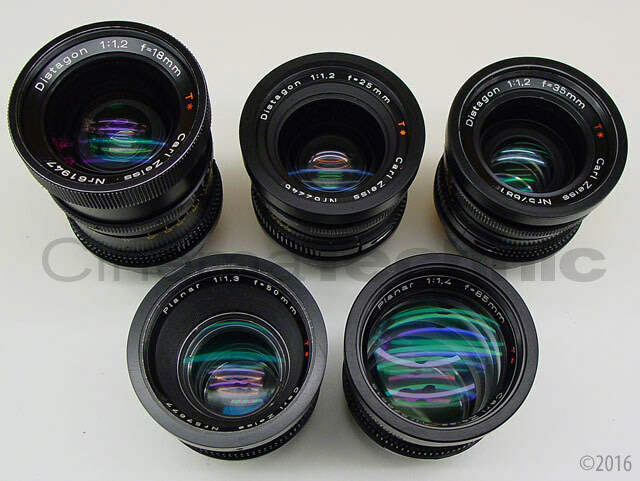 The 18, 25 and 35mm lenses are f1.2, the 50mm is f1.3 and the 85mm f1.4. The lenses in the photo have had 80mm fronts, focus gears, and PL mounts added to them as upgrades. Carl Zeiss High Speed lenses, commonly called Super Speed in the U.S. and U.K. introduced the largest aperture available for cinematography in a complete lens series, f1.2, a full half-stop larger opening than f1.4. Carl Zeiss was not the first to introduce a high speed lens series. Canon had already introduced the K-35 cine lenses about a year before. Zeiss was the first to introduce a high speed lens series where all focal lengths were specifically designed as cine lenses, and with the second generation, where all lenses were f1.2. With the exception of a few specialized lenses, such as the Panavision 50mm T1.0, and Hawk’s recently introduced T1.0 series, this is the largest “fastest” aperture offered in cinematographic lenses. The Carl Zeiss High Speed lenses had their genesis in the Planar 0.7/50mm lens commissioned by NASA in 1966. 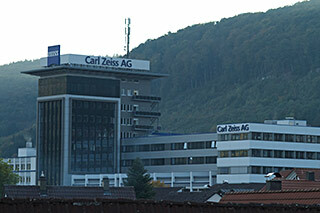 The first generation original series Carl Zeiss High Speed (HS) lenses were first manufactured in 1975. They were among the first Zeiss lenses to have the Zeiss T* multicoating, which increases contrast and overall light transmission (T-stop) and reduces flare. They were only available with ARRI Bayonet lens mounts. This mount had been introduced in the mid-1960’s on the Arriflex 16SB, 16BL and 35II-C and was ARRI’s lens mount until the introduction of ARRI PL mount in the early 1980’s. The original HS series have housings that are designed to fit into the prime lens blimp that the Arriflex 35 BL-I and BL-II required for silent shooting. They do not have focus or iris gears, but instead use removable tabs fitted to the focus and iris rings that are meant to be actuated by rubber coated levers inside the prime lens blimp. The 35mm format set comprised of three Distagons: 18mm, 25mm and 35mm, with an f1.2 aperture, and two Planars 50mm f1.3 and 85mm f1.4. All lenses were marked T1.4. This seems quite optimistic on the 85mm and probably the 50mm as well, but when I tested an original HS set with the Zeiss T Stop Tester results were within the margin of error for T1.4. All the Mk. I T1.4 Super Speeds have a unique nine-blade iris with the shape of a Reuleaux Triangle. It is not known why this type of iris was used. A possible reason is that the deeply curved blades reduce streaking from bright points of light. The disadvantage is that when stopped down, the shape of this iris becomes a nearly true equilateral triangle. Out of focus highlights (bokeh) will take the shape of the iris. Minimum aperture is T11. The iris ring has click-stops that can be set on/off by moving the small hat-shaped button front-back. Stanley Kubrick purchased a set of the original Zeiss High Speed primes, which are on display at the Kubrick Archives Exhibition. They became available far too late to photograph the candlelight scenes in Barry Lyndon where the famous Carl Zeiss Planar f0.7/50mm was used instead at great effort and expense. But the distinctive triangular bokeh of the Gen. 1 HS primes can be seen in the penultimate scene in Full Metal Jacket. Look at the background in close-ups of the soldiers to see it. Parts for the original Zeiss HS lenses have been hard to come by for as long as I have been servicing cine lenses. I don’t know when the service obligation (parts availability from Carl Zeiss) ended, but it was most likely over by 1995. Note the aftermarket focus gears, of a clamp-on design (I believe these were made in Germany many years ago), the Delrin 80mm fronts (except on the 18mm) and the Visual Products PL mounts. Original Zeiss High Speed primes can be upgraded to have a function more like the newer versions. The needed mods are 80mm fronts, focus gears and PL mount conversions. They cut fairly well with Gen. 2 and later HS primes. The differences are slightly more flare and veiling glare, and a slight greenish tint to the shadow areas. These are subtle differences and the most noticeable difference is the bokeh from the triangular iris. There is no noticeable difference in sharpness. It should be noted that the Mk. I / Mk. 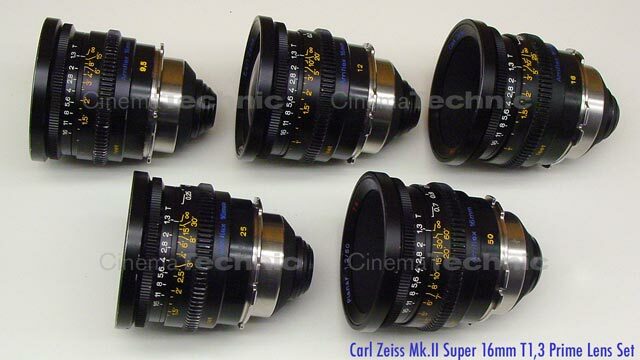 II designations and even the name “Super Speed” were never used by Carl Zeiss in reference to these lenses (although ARRI seems to have used these names). The only Zeiss lenses officially called “Super Speed” are the CP.2 T1.5 series. There is some argument in the U.S. as to the naming convention. Some call the first generation HS lenses the Mk. I, and some call them the B-Speed (“B” probably stands for “Bayonet”). Some call the first version of the second generation HS primes the Mk. I. To avoid confusion, for the purpose of this article, we will refer to first, second and third generation lenses, and the first generation lenses will be considered the original HS primes. An original Mk. I S16mm HS prime – Distagon 12mm. Note that the lens in the photo is not stock – it has a custom CinemaTechnic aluminum 80mm front. However it is so well integrated that the difference will only be noticable upon comparison to an unmodified lens. 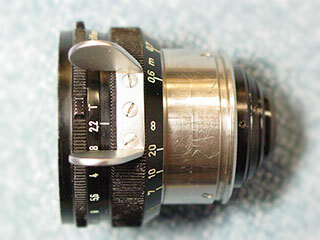 Also note the lack of focus or iris gearing, the three holes for the focus “ear” on the focus scale ring, and the bayonet lens mount. 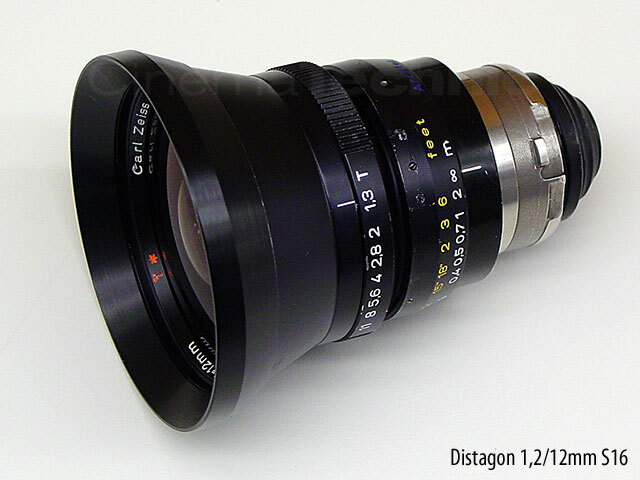 The Distagon 1.2/9.5mm looks identical, the 16 and 25mm are slightly shorter. There was no 50mm S16 Mk. I HS prime. 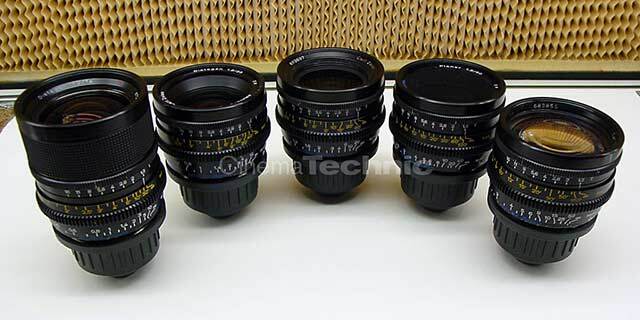 The 16mm set comprised of four Distagons: 9.5, 12, 16 and 25mm, f1.2, all with a photometric aperture of T1.3. These were the first 16mm prime lenses designed to cover Super 16mm format. The 9.5mm focal length covers the full S16 aperture, but is somewhat compromised in sharpness and illumination past the corners of N16. For this reason ARRI did not include the 9.5mm on their list of S16 compatible lenses. All the S16mm Mk.1 lenses were fitted with 6-blade hexagonal iris. The mechanical design of the Mk. I S16 Superspeeds was similar to the 35mm Superspeeds, but smaller. The lens mount is the original Bayonet design that uses a pin on the back of the lens for location and a lock ring to hold the mount in place. Front housing diameters were 70mm for the 9.5 and 12 and 62mm for the 16 and 25mm. The length of the 9.5 and 12mm are longer than the 16 and 25mm. The focus scale rings are small in diameter and very thin. Focus gears were not fitted. Instead, focus “ears” of chrome plated steel were fitted to the focus scale ring. This was meant to allow the rubber parts inside the 16BL and 35BL prime lens blimps to move the focus ring. The very compressed focus scales gives very few focus marks for the camera assistant and the thinnes of the scale ring complicates the addition of follow focus gears. Add-on gears cannot compress the scale ring because it will rub on the lens housing and greatly increase the effort needed to move the focus, or in some cases, it will bind up altogether. All of these lenses cover the Super 16 format. ARRI does not list the 9.5mm as covering Super 16 because it is not as sharp in the corners of the S16 frame as it is in the corners of the regular 16mm aperture. Also there is some vignetting when the 9.5 i stopped down past T8. In practice, I have never had a problem working with the 9.5mm Distagon in Super 16 format. I reccomend never stopping down past T8 in the S16 format. An original second generation (Mk. II) first version S35 format Distagon 1.2/25mm HS. These lenses had an entirely new mechanical housing, with an integrated focus gear, and are compatible with PL mount only. The first version Mk. II lenses. Focus scale rotation is about 170º and both the feet and meter marks are ahead of the focus gear. This was a lens that I reconditoned and sold, so the feet footage marks were repainted high visibilty yellow, rather than the original dark orang which is hard to see on a dark set. Second generation High Speed lenses were introduced in early 1984. They represent a complete re-design of the mechanics, and an optical re-design for the Planar 50 and 85mm to achieve a true f1.2 aperture. Because of the limited diameter available inside the ARRI bayonet mount, the rear elements on the 50mm and 85mm Planars could not be large enough for f1.2 aperture. The 18, 25 and 35mm lenses retained the original optical design. Adjustment points for optical alignment were added to the Distagons, but the Planars have no optical adjustments. Gen 2 lenses are only available in PL mount. I have seen BNCR versions but these were retrofits and were not produced by Carl Zeiss. Gen. 2 HS lenses all have 80mm front diameter rings. The focus helix threads were of a larger diameter and the linear guides are larger and more stable. Click stops on the iris were eliminated. Focus scales on the Gen. 2 are much larger and have integrated focus gears of 0.8 Module pitch. Focus scale markings are meters on one side and feet on the opposite side (flip the lens 180º). Focus travel is about 170º. The Bayonet mount, with its troublesome pin and lockring attachment was replaced with a large and stable PL mount held by eight 2mm screws. On the 35mm Mk. II lenses, only the 54mm O.D. ARRI PL mount can be fitted. On the S16mm Mk. II lenses, either Bayonet or PL mounts can be fitted. The design of the mount proved so reliable that it is still in use on the new Ultra Primes, CP.2 and Master Primes (modified to accommodate the LDS contacts). The 35mm set has different overall lengths (the 18mm Distagon is the longest). But the focus gears are all the same diameter. Other than slight adjustments to the position of the matte box, lens changes can be quickly accomplished. The external dimensions of all the focal lengths of the S16mm lens set are the same. This allows very fast lens changes on set. All the lenses have 80mm front diameter and integrated focus gear, all the same diameter (76mm). 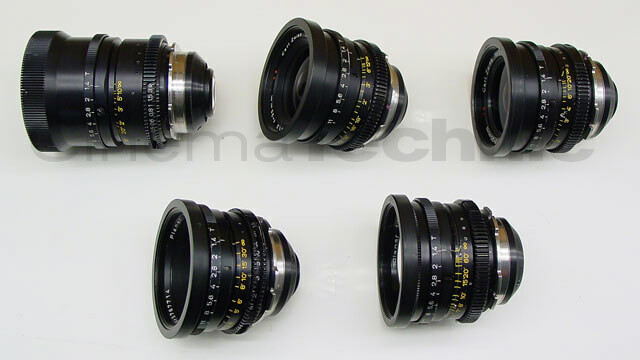 All the 16mm format HS lenses are the same physical length. Lens changes can be made in about 15 seconds. The larger diameter focus scale allows for more focus marks and more space between the marks. A major problem with the Mk. I S16 and S35 sets is the very limited focus marks on the scale ring, combined with the minimal depth of field at T1.3. This meant that eye focus was the only way to go with the Mk. I lenses. The camera assistant had hardly anything else to work with. The Mk. II focus scales are calibrated in feet and meters. On S16mm and early version S35mm Mk. II lenses, the scale rotates 170º and each side of the lens has one calibration, ether feet or meters. The marks are oriented along the optical axis of the lens. When the camera assistant needs to switch sides on the camera, he can “flip” the lens by loosening the PL mount and rotating into another of the four available positions. In this way either the feet or meter scale can be used on either side of the camera. The S35mm Mk. II lenses switched from the 9-blade triangular iris to a 7-blade iris. The S16mm Mk. II lenses switched from 6-blade hexagonal to a 9-blade Ruleaux triange iris very similar to the Mk. I S35mm set. The aperture closes down to T16 rather than T11 of the Mk. I lenses. 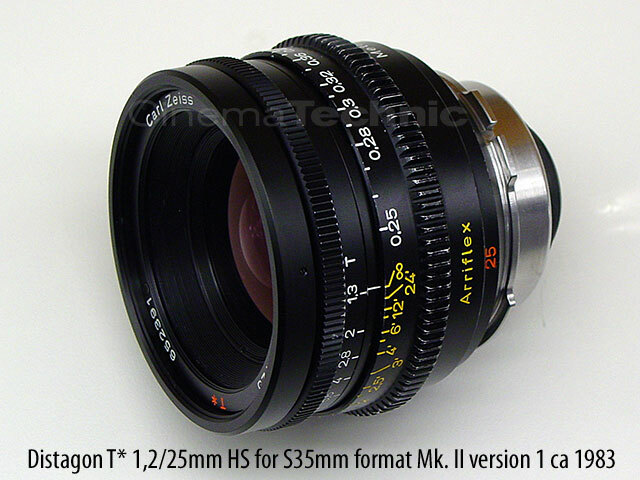 Super 35mm T1.3 Mk.2 set: 18, 25, 35, 50, 85mm, all f1.2 / T1.3. PL mount only. Pictures is the version with wrap around focus scales. The feet markings have been painted bright yellow for better visibility (stock is dark red). The set pictured was sold by CinemaTechnic in February 2006. An updated version of the Mk. II S35mm lenses was introduced in 1988. These have a “wrap around” focus scale with about 350º rotation. These scales have meters in front of the focus gear and feet markings in back, with both scales reading from the same index position on one side of the lens. 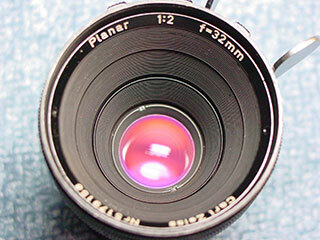 This version also introduced the Planar 1.2/65 mm which is not available in any previous version. The focus helix thread was changed in pitch/starts to increase the amount of rotation needed to go from infinite to minimum focus. Four adjustable linear guides reduce play in the focus mechanism and give a smoother and more consistent focus feel. Spare parts for the updated second generation lenses were available until February 2015. The complete Mk.II Super 16mm format Super Speed set: 9.5mm, 12mm, 16mm, 25mm, 50mm all f1.2 / T1.3. The set pictured here was fully overhauled and has been upgraded with new PL mounts and the focus scales have been repainted. This is one of several sets that have been sold by CinemaTechnic in the last few years. The Super 16mm format set shares most of the upgrades with the 35mm set. The barrels on the 16mm lenses are slightly smaller in diameter than the 35mm set, but the 80mm fronts and lens mount are the same. The 16mm set can be fitted with ARRI Bayonet mounts, while the 35mm set cannot. All the 16mm set lenses are the same length, and focus gears are the same diameter and distance from the lens mount, making lens changes very quick. The optics on the 9.5, 12, 16 and 25mm lenses are substantially the same as the Mk.I. There are some upgrades in the fitting of the front elements and internal baffling to reduce flare. The 50mm f1.2 Planar for S16mm is a new optical design introduced with the Mk.II lenses. This is an incredibly sharp lens and actually covers 35mm (Academy) but is soft in the corners. Because of the position of the rear element, the 50mm for 16mm format should never be fitted to a 35mm reflex camera, due to the risk of damage to the mirror shutter. Right: Mark III High Speed lenses were available in both S16mm and S35mm versions. I will be updating this page with images of the S35mm version. However, the appearance of the S35mm version is very similar to the S16mm format lens pictured here, just with a somewhat larger diameter. The Mk. III version have a gear on the iris ring and larger more legible focus marks. The mechanics of the S35mm format versions 2.1 and 3 are neraly identical. The S16mm format lenses have a different focus helix thread that allows rotation of nearly a full turn. Mk. III focus scales are slightly larger in diameter than Mk II and are marked in feet or meter exclusively. The focus gear is 80.8mm diameter for S16mm lenses. The focus marks are larger and have witness lines engraved underneath to show exactly where each distance is calibrated. The marks are oriented at 90º to the lens mount instead of on the axis of the lens. There is one scale for each side of the lens, so the assistant does not have to “flip” the lens over to have a focus scale available when switching sides on the camera. Although there is more room on the Mk III scale ring due to the longer rotation, the larger size of the marks means that there are less marks near infinity. Optics are the same for the Mark II and Mark III versions, both for S16mm and S35mm format lenses.